The use of physiology-based interaction in collaborative scenarios is a rapidly developing area of research that has a strong potential for innovative applications. 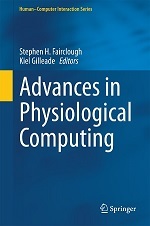 This aspect of Physiological Computing has become an important topic for our research group, where we focus on the enhancement of collaborative music generation experiences by combining explicit, gestural interaction with implicit, unconscious interaction using physiological signals. By following this approach, we aim to develop new expressive multimodal interfaces capable of bringing meaningful collaborative experiences for both entertainment and clinical applications. Based on our earlier experiments and prototypes with affective games and biosignal adaptive applications we have identified that the major obstacle of understanding the biosignal adaptive gaming is lack of longitudinal experiments. In order to achieve this goal we have developed a persistent mobile multiplayer game that utilizes biosignals and can allow organization of experiments were subjects use the game repeatedly over long time period. In order to achieve this we have invested special attention on the games communication architecture, game story and visual identity. The game is called Tangent Society and it will be launched in beta during the Spring 2011. The game is based on real-time web environment and it utilizes simple biosignal capturing sensors (e.g. Polar Bluetooth heart rate band) in addition to the phone’s inbuilt sensors (accelerometer and camera).